Powers/Abilities: K'tor possesses the standard abilities of members of the Shi'ar race. (Uncanny X-Men#478/#481 (fb) - BTS) - At some point, Vice-Chancellor K’tor, a loyalist of D’ken, continued the tradition of slaying all the descendents of Rook’shir. He killed several young men and sterilized their mother. He kept the last descendant, Korvus, as a slave, and Korvus was tortured as he worked on mechanical constructs. When he reached adulthood, Korvus was imprisoned in the high security prison on the moon of Phygim. (Uncanny X-Men#480) - While the Imperial Guard battled Vulcan (an Earth mutant who had been wreaking havoc through the Shi'ar Empire), the commander of the ship M’kaedo contacted K’tor, reporting his manipulations of Vulcan and the two of them agreed that they could use Vulcan to restore D’Ken to power. K’tor relayed the command to take Vulcan alive through the implant in Gladiator’s brain, and Vulcan was defeated and taken to Phygim. Vulcan, who’d lost an eye in the battle, had a new eye put in, and he was placed in a specific cell at K’tor’s orders. (Uncanny X-Men#478) -Two Shi'ar pilots captured Professor X (the criminal former consort of Lilandra) delivered him to Vice-Chancellor K’tor as soon as they could. Meanwhile, Commander N’ruto delivered news of the stargate destruction and the approaching Marvel Girl. K’tor decided to keep this information secret from Lilandra, who he claimed was still in fragile condition. He then approached Korvus in the Phygim moon prison, and offered to commute the rest of Korvus’ sentence if Korvus would act against Marvel Girl. (Uncanny X-Men#479) - K’tor allowed Korvus to take the Blade of the Phoenix and Korvus left to slay Marvel Girl. Korvus ended up escaping, though, and joined forces with the X-Men. (Uncanny X-Men#480) - Vulcan remained imprisoned for weeks, tormented by his memories, until a D’Ken-supporter freed Vulcan (likely on K’tor’s orders), telling him to free a prisoner two floors down. Vulcan slew at least four guards to free Deathbird, who stated she’d been imprisoned by Lilandra to protect the throne. (Uncanny X-Men#481) - K’tor contacted Araki and let him know of the plan that had been put into place. Araki then took Lilandra captive. 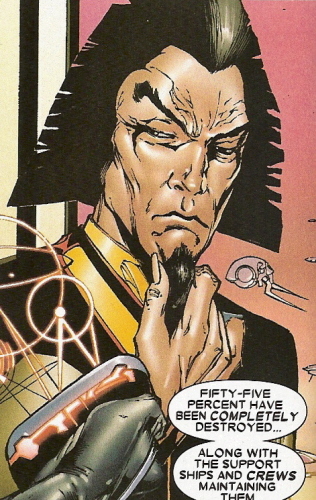 Shi’ar refugees delivered Professor X to K'tor at the High Council Starways. K’tor authorized the torture of Professor X using the Kiss of Agony, a device that seared pain through to the brain. (Uncanny X-Men#483) - Deathbird and Vulcan became lovers, and soon heard from K’tor that D’Ken had been slowly recovering. They traveled to D'ken's side and Vulcan healed him, restoring D'ken to power. Comments: Created by Ed Brubaker, Billy Tan, Danny Miki, and Allen Martinez. Later on, Deathbird and Vulcan were married and Vulcan killed D'ken. K'tor was not seen in the rest of this story. or any other characters not mentioned in this profile.